Writer Mark Wilson at Fast Company came up with the idea of an electric car that splits into “two badass motorcycles” as he loved the idea of owning both in one vehicle. The two segments fasten together at the bottom with special attachments, which can be released at the push of a button. When the vehicle is functioning as a car the front wheels are kept close to the vehicle, but when the sides split into motorcycles the front wheels extend to give the bikes more stability. The wheels can also tilt sideways to the segments can be ridden as bikes. According to Wilson, the idea behind this car is to offer the social experience of a car while also featuring a personal urban transport vehicle that is sporty. It measures in at a length of 128 inches and resembles a buggy like vehicle. It has been inspired from Batman Tumbler and work by Syd Mead. 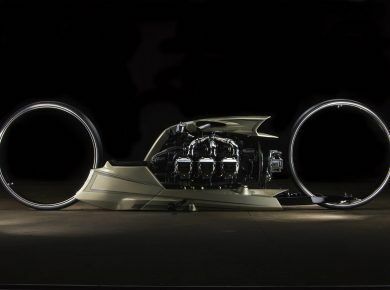 It transforms into two motorbikes that are closed-top when it splits. After argodesign did their bit, Mark took the concept to the New York Auto Show to propose the idea to car firm.